I’ve been reading lots of short stories lately because we’ve been getting some cool collections of short stories for children and young adults in our library. 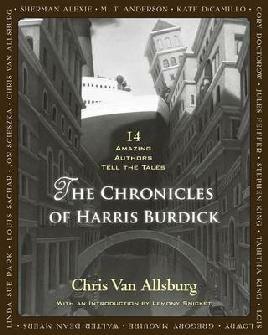 The Chronicles of Harris Burdick is a collection of short stories written by 14 amazing authors, including Kate DiCamillo, Louis Sachar, Jon Scieszka and Lois Lowry. The stories are based on the original illustrations from the book The Mysteries of Harris Burdick, in which there are only illustrations with a title and caption. I got introduced to this book about 8 years ago when I was at Teacher’s College and have loved it ever since. There’s a whole mystery to the book and where the illustrations have come from. Who was Harris Burdick and why did he disappear after dropping off his illustrations? If you’ve never seen it you should definitely get this from the library to have a go at making up your own stories to go with the pictures. I love this book! Not only are there so many great stories by some of the best children’s authors, but the book is beautifully designed too. There are stories for everyone in this book, from the magical and funny to the strange and unsettling. There are naughty children, different dimensions, a wizard, floating nuns, aliens, ghosts, and a horrible stepfather who gets his comeuppance. All of the illustrations are amazing and you could make up all sorts of stories about them. I liked some of the stories more than others. Some of them are really strange and others just left me thinking ‘what just happened?’ My favourite story is The Harp by Linda Sue Park, about two sisters who are always bickering and get a spell put on them by a wizard. Get a copy of The Chronicles of Harris Burdick and discover this strange collection of stories from some of your favourite authors.